The band is still alive…stay tuned for updates! Today is the day! Danger Avenue…for the last time in a while…live!! Tonight at Sticky Fingers will be the last chance for a long time to catch the band where they truly belong, on the stage! We want to thank everyone for the first 10 years! A decade in Rock! A big, big thank you to all our fans through the years! Danger Avenue live at Göteborg Rockfest May 6th! The band will draw one hell of a crowd to Gothenburg’s biggest all rock festival Göteborg Rockfest! Friday May 6th the band will take the stage at Sticky Fingers Top Floor in Gothenburg to take part in a celebration of rock n roll with, among others, Imperial State Electric and Horisont. This will be the last gig in Gothenburg for awhile so don’t miss it!!!! Danger Avenue will strike with full power and the energy of a jumbo jet! See you there and keep on rockin’ an’ doin’ it! Danger Avenue will strike Stockholm and Harry B James with a leathal dose of rock ‘n’ roll on March 11. RSVP on Facebook. 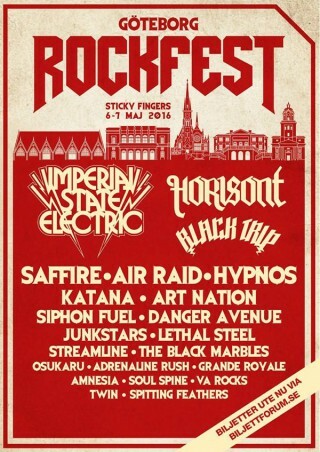 The band has also been invited to play the prestigious Göteborg Rockfest alongside Imperial State Electric. Other confirmed acts are Horisont, Sapphire, Art Nation and Streamline. Danger Avenue will be playing on Friday, May 6. Get tickets to Göteborg Rockfest. We play classic rock with energy, balls, melody and emotion. Our new album will be out later this year. The first single Trees is out now! For interviews, booking and other inquires, send an email to info@dangeravenue.com.